Space Force is not a very political show but makes no bones about the fact that it was inspired by Trump’s idea and became an exploration of what might happen if Australia followed suit? It opens with the audience being trained as recruits for the new Australian Space Force and there began a running gag in the show. The 5 talented, confident performers Ella Lawry, Georgie Daniels, Isabelle Knight, Madi Savage and Millie Holten, have had experience in uni reviews, which shows, and impro such as Improvised Shakespeare. There is certainly a vibe of an old fashioned uni review here, which is in no way a bad thing as so many famous comedians learn great skills this way. Each scene ends in a blackout (often for no really solid reason) and many with a round of applause. Only one scene change, the setting up for the restaurant scene, which is a little long, is covered by one of the members doing some musical comedy on the ukulele and this ended up being a highlight of the show for me, especially when there was a bit of a prop drop and she was able to improvise some laughs out of it without batting an eye. The scene changes could easily be dropped and the show could be a straight narrative which would make for a smoother running show. What takes Space Force above the average uni review style show is that every one of the performers is uniquely comedically talented, and also that more money and effort has been put into the impressive props and costumes. There is also a delightful and unusual sense that this has not been completely bourne out of impro and faffing about, but rather much has been script written, containing a lot of funny lines and thoughtful weirdness. Not all the ideas land, of course, but the ratio of laughs is pretty high. The restaurant scene was the hardest to pull off in every way. Farce is hard and requires very fine skills and the tightest of timing. The performers clearly know all ingredients but like the scene they are performing are throwing them around a bit willy nilly hoping they will stick. They don’t quite get there, but hopefully will learn and improve with each performance and it’s still pretty entertaining to watch. A warning, if you sit in the front row you might get wet, and not just with water. The young women of the SS OZ give me hope for the future of comedy, particularly sketch comedy and I can see some of them becoming the comedy stars of tomorrow. So why not join Flat Pack and see them before they are famous? Space Force is on at TIC Swanston, on the corner of Flinders Lane and Swanston, (The Nicholas Building) take the lift to the 5th floor and follow the signs. 1. In 2018, Australia established a Space Agency and you must educate yourself. 2. All of us are vaccinated. Bar one. Guess who it is! 4. We are very close to Melbourne Town Hall, and more importantly, emotionally very close to our mothers. Bar one. Guess who. 5. 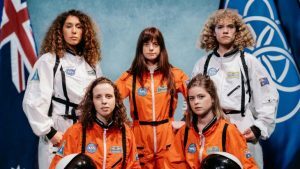 The cast are five experienced comedians who will probably never get to wear space suits again. Watch them sweat.